Car makers of present day, in order to enhance gas mileage and overall vehicular performance, have created many new challenges for alternator manufacturers to address. The entire industry tends to use larger, heavier alternators with more internal spinning mass. This creates great amounts of inertia to be dealt with. When the engine decelerates quickly, the alternator can’t slow down as fast as the engine. Belt chirp and premature belt wear or even failure would be eminent. 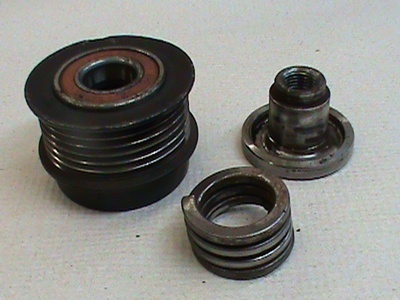 The fix is the advent of the overrunning alternator pulley (OAP). The OAP is basically a one way clutch inside the pulley. This allows the rotor to coast to a stop or go through an RPM adjustment period when the engine belt is quickly stopped or changes speed. This feature effectively eliminates belt chirp and belt wear on fast stops and transmission downshifts. Reduced load on alternator and all other bearings allowing longer component life expectancy. Note : Some vehicles have been known to be able to actually “feel” the increased vibration in the steering wheel being transferred in the belt when an alternator is installed with a standard pulley instead of an OAP. The entire automotive design engineering industry is required by congress to increase fuel economy, while simultaneously reducing expulsion (green) requirements. Studies show the periodic highly inflated price per gallon of gasoline drives consumers and fleets to focus on fuel economy when choosing a car manufacturer from which to make a purchase. The overall designs must continue to shrink engine size and integrate more diesel fuel options. Idle speeds had to be pushed to the lowest RPM possible. Also, overall vehicle electronic luxury has become increasingly competitive and complex. These requirements caused a virtual nightmare of new problems to the serpentine belt systems such as belt slippage, belt induced vibration, excessive belt noise and harshness. The OAD pulley (overrunning alternator decoupler) can provide the isolation needed to solve these new design challenges. 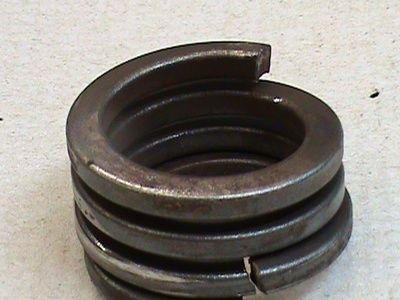 By designing a torsion spring inside the pulley, the pulley and the alternator shaft are no longer one piece. They are essentially decoupled so there is not a direct mechanical bond. Also, the one way clutch is still included to correct overrunning inertia problems. 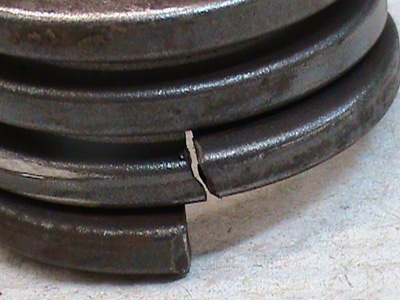 Absolutely efficient stabilization of belt bounce and vibration problems. Reduced level of force on the belt. Reduction of required tensioner force and range of motion. 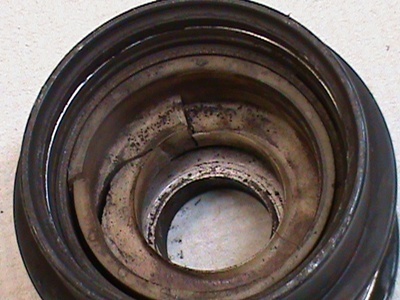 Increased life expectancy of belt and tensioner components. The use of the OAD also reduces the side pressure to all the bearings in a system, including power steering pump, water pump, air conditioning pump, and front and rear bearings of the alternator itself. This permits the use of narrower belts and less tension. 1. This is a torsion spring from the inside of an OAD pulley. You can see where this one broke which is fairly common. 2. 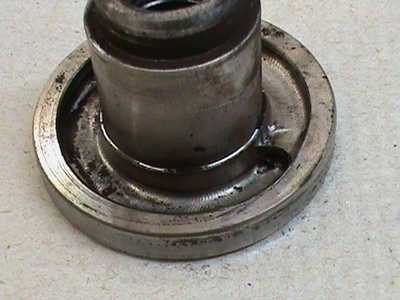 Inside the outer shell or case of the pulley is a plastic bushing which is commonly worn or destroyed after higher mileage sets in. 3. 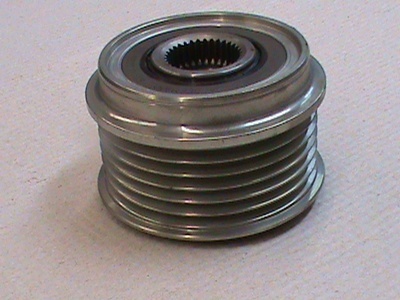 Notice the end of the torsion spring which fits into the shell of the pulley.The other end of the torsion spring fits down into the center piece which threads onto the shaft. 4. Notice the groove in the center hub piece where the torsion spring mounts is worn. This piece threads to the alternator shaft.